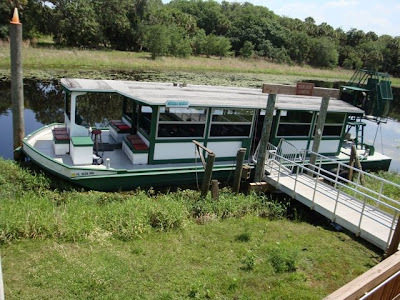 The Marine Installer's Rant: Bird eating spiders, and the "World's largest air boat"
The Myakka Maiden, and its sister ship are perfectly designed for this environment. 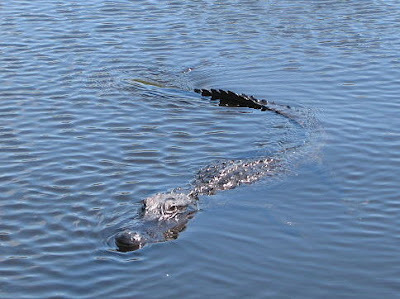 The upper Myakka lake is very shallow, and in many places it is choked with water hyacinths. An air boat operates very well here, and the large propeller will never get clogged with the less than indigenous plant life. 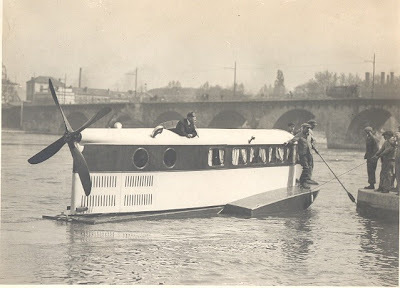 The unique marine power plant is a circa 1975 500 cubic inch Cadillac engine belt driving a Sensenich three bladed aerospace grade carbon fiber epoxy propeller. The pitch is ground adjustable, and tuned to the engine rpm's. The end result is the drive system is surprising quiet. Now I don't want you to think you're sitting in the proverbial "Cone of Silence" when the boat is running, but you can hold a conversation with the person next to you without yelling. When the Myakka Maiden is operating at full throttle, I would guess we were achieving a blistering five or six knots, or translated, I didn't need any product to keep my diminishing hair in place. The instrument panel is sparse, but complete, and contains the same gauges you would find in your car. The helm wheel is a marine hydraulic system, that is used to turn the rudders, and by that I mean the air rudders, along with the water rudders. A shaft hangs from the overhead, that operates the throttle. There is no GPS based chartplotter, because it is not functionally possible to get lost on the lake, so no business for the Installer here. I asked a knowledgeable staff member, shortly after I was told I shouldn't be where I was when I took the picture below, "why the rudders were chained up", and the short form of the answer was "It seemed to be a good design idea at the time, but they didn't make much difference in the steering, and they dragged a lot of water hyacinths along with the boat slowing it down." Another item for the "Museum of Shattered Dreams" vast collection, and water rudders on air boats are a rarity. 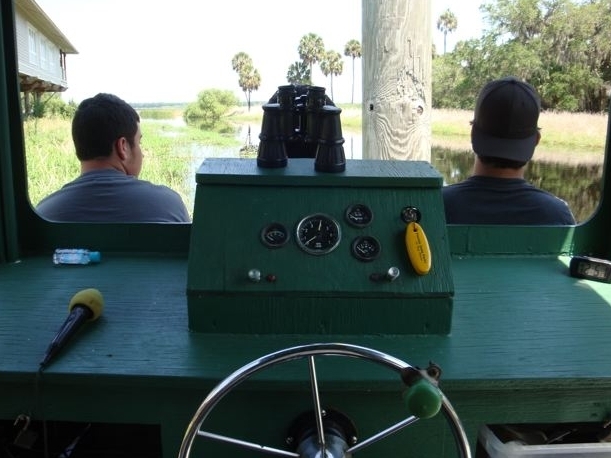 One of the most interesting, and challenging aspect of captaining an air boat is docking. 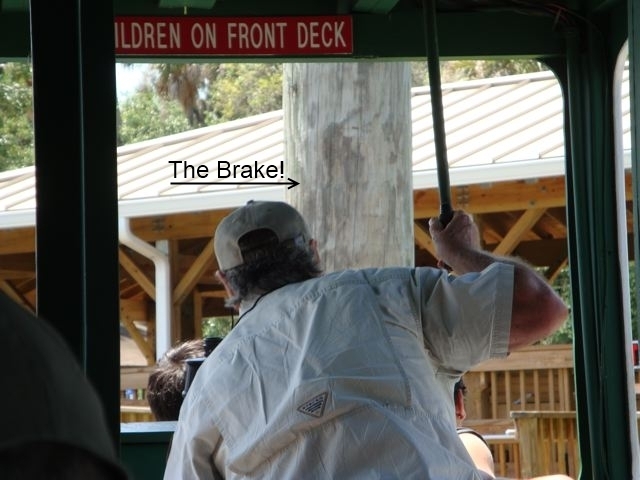 This activity is potentially fraught with adventure because an air boat has no reverse, and I would add, no brakes. The docking system is simple and ingenious. The captain creeps in at a crawl, and advises the passengers there will be a small bump, and there is. The actual brake is the substantial post seen in the picture below. In this case the captain nudges the post on the starboard side, turns the rudders hard to starboard, and guns the engine. The vessel gracefully pivots around the post 180 degrees into the dock. It looks easy, but I think doing it a zillion times does the trick. 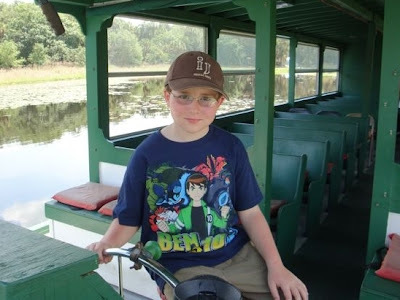 I posed young Dexter at the helm, to provide him with thanks for being the source for this impetuous, (look it up Dexter) and fun expedition. He deserves these few milliseconds of fame. In spite of my light tone, this was a good adventure, and was most enlightening. I'm thinking next time Dexter, we will try to convince your mom we should go parasailing, it might work you know, sort of, oh darn, maybe not. I will try to come up with something else with the appearance of being fraught with danger next time involving boats of some sort. 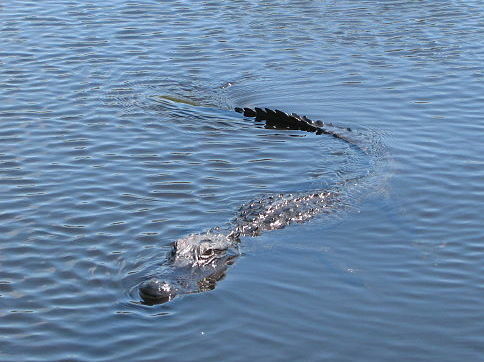 Myakka River State Park is Florida's largest state park, and offers 39 miles of hiking trails, fishing, kayaking and canoeing, and much more. At $6.00 per carload for parking this is a good bang for the buck. 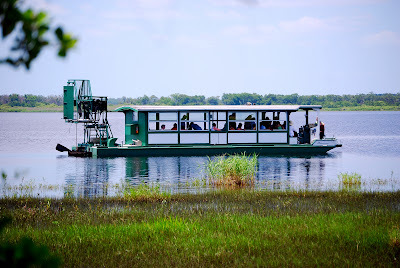 The air boat ride is $12.00 for adults, and $6.00 for urchins and its also good value, very interesting, and you can tell everyone back home from Lake Woebegone you have really been on the world's largest air boat. You never know what you will find unless you go looking. My prior sense of what air boats were all about has been driven by seeing ads for Everglades tours, and occasional TV clips, but these unique vessels serve a needed boating niche. The first air boat was built in Nova Scotia by a team headed by Alexander Graham Bell (yes the phone guy) in 1905, and was used to test aircraft engines and prop configurations. 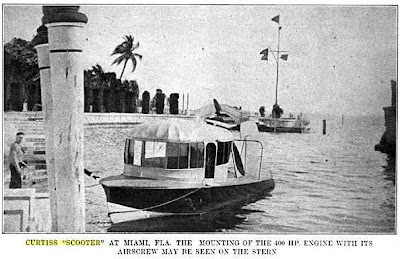 The first air boat registered in Florida (1920) was built by Glenn Curtiss (of Jenny aircraft fame) and was called the Curtiss Scooter (seen below). Another interesting historical air boat is this sleek retro looking French built Farnam "Hydro Glisseur" circa 1924. This vessel isn't quite sure exactly what is. Part air boat, part car, part airplane, and part hydroplane. It was capable of about 60 miles per hour. Jumping back now to the present, air boats play a large commercial role, and perform work boat tasks that can't be done by conventional watercraft, especially in very shallow waters, marshes, and other wetland areas. These jobs include power line, and oilfield maintenance, oil spill and storm clean up, all with a minimum of environmental impact. In the video above you can watch a four engine, 2000hp air boat with a crane mounted on it come into a facility to retrieve a large piece of equipment. It is apparent, no other form of transportation is capable of performing this task. The air boat above was built by Ronnie Thibodaux, who has pioneered the use of air boats as commercial work vessels equipped with bucket lifts, cranes, drilling augers, backhoes, and other heavy industrial equipment. I have spoken to Ronnie several times, and he is a guy who is certainly excited about air boats, and thinks on a grand scale. The hull pictured above was going to be the world's largest air boat, and at about 80', it would have been. 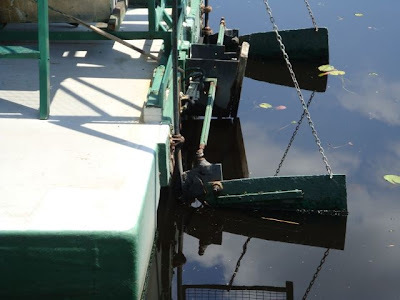 But Ronnie has decided that wouldn't be good enough, so the design was modified to turn it into a very shallow draft work boat with a large crane mounted on it. It is powered by a large bank of outboard engines. Ronnie is planning construction of a 100' air boat that will be powered by two Pratt Whitney JT8D series jet engines (he has them already) that can develop a whopping 30,000 lbs of thrust, augmented by two pairs of 300hp outboards to provide maneuverability for docking. It is nearly impossible to convert thrust to horse power (another one of those pesky physics things), so let just leave it as a huge herd of buffalo stampeding. Now that will be one bodacious air boat when it is finished, and I think it will be a very tough record to beat. I definitely want to ride on it when it's done Ronnie. I'm not going to put the Guinness record people out of business, but here is my take on the current records for air boats. The largest existing air boat is the Myakka Maiden (52'), followed by Gator Gal (50'), and then in third place is Chain Electric's (45') four engine air boat, despite their claims it is the world's largest. Thanks again Dexter, it turned into a really interesting meander. Many thanks to Ronnie Thibodaux of Ronnie Airboats for answering my million questions, and you can read an article by Jeff Hemmel about his adventure with Ronnie in the "Super Mud Boat" he built for Governor Mike Foster of Louisiana. Quite the vessel, and story, jumping beaver dams and more. The picture of the Myakka Maiden actually came from the website Airboat Afrika, It's a long story revolving around the lack of a battery in my camera, and thanks to Theresa (Dexter's mom) for letting me use her camera. 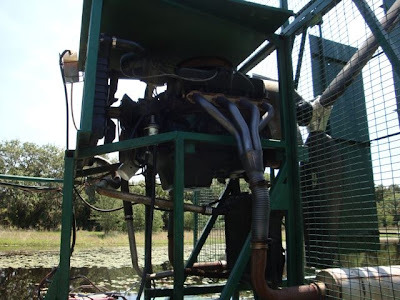 This is an excellent site to explore air boats, and their uses. Just tidbit I found after the fact. Below is a actual photograph of Alexander Graham Bell's "Ugly Duckling". I found an article he wrote for the National Geographic Magazine 1n 1907 that contained a photograph of the airboat. You can follow the Google books link to read his full text. I was wondering if you own any of the historical photos, or where you got them from. Could you tell me the source of your Curtiss Scooter clipping? I'm gathering info for a scale model. You might try contacting the Curtiss Museum. Thanks Bill! That link mentions a museum in Miami that may have more as well. I have one good side shot that I had enlarged to 1/4 scale based on the known length of the Liberty V12...the thing was almost 32' long! My pleasure Keith. Good luck, and send me a pic when you're done and I will add it to the story.